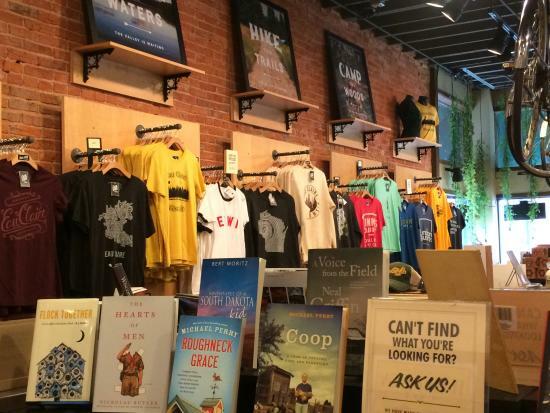 Located in the Volume One World Headquarters, The Local Store has been the place to go for merchandise embodying the spirit of the Chippewa Valley. 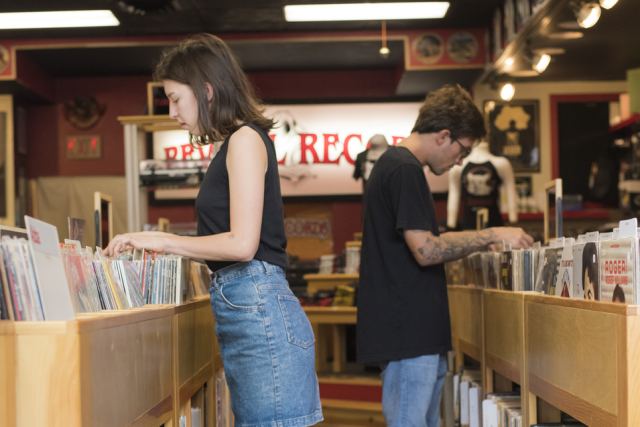 At The Local Store, you’ll find music, books, glassware, jewelry, children’s toys, games, art prints, apparel, knit goods-the list goes on and on. If you’re looking for a thoughtful, fun and unique gift, The Local Store will have something for anyone on your gift list (anda few things for yourself). Artisans, artists, and crafters from all over Wisconsin and the Midwest supply the products sold at The Local Store, and many are from right here in Eau Claire. 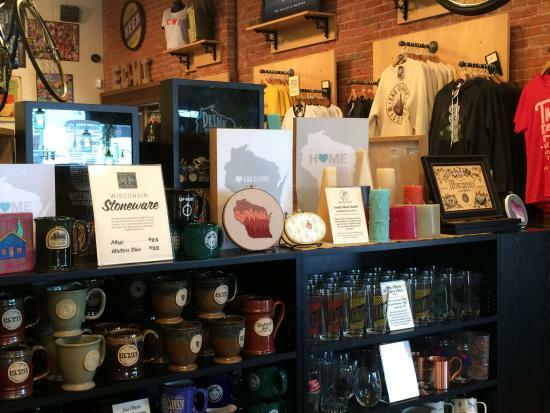 Some of the Eau Claire merchandise includes apparel and art prints from Ambient Inks, wood Kubb sets from Kubb Farm, and coffee from Honest Roast Coffee. 3. Local Music and Books! The Local Store stocks an amazing array of works by local talent. You’ll find more than just Bon Iver (but of course you’ll find them too), Eau Claire also has great acts like Waldemar, S. Carey, Volcano Choir, and Brian Bethke. If you’re a fan of vinyl, they’ve got you covered. For the readers, there are children’s books, mysteries, books on local history, essays, sci-fi, etc. Two of the best selling authors, Michael Perry and Nickolas Butler, are nationally known. Fun Fact: You’ll find Michael Perry is not only an acclaimed author, but an accomplished musician as well, and you can pick up his books and albums at The Local Store. 4. The Volume One Gallery! 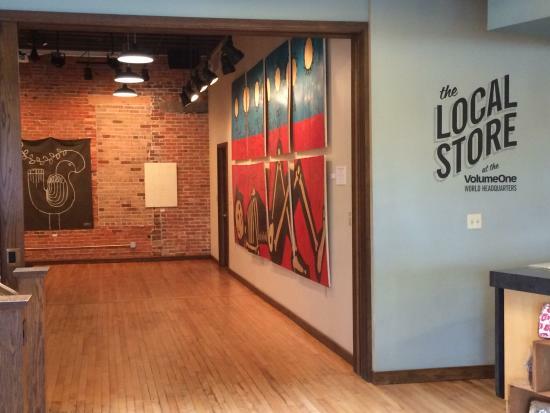 Conveniently located in The Local Store, The Volume One Gallery is a beautiful space that hosts art shows and artist receptions, book readings, music performances, and one of the most popular events of the year, the Ink and Paper print sale. The 2017 Ink and Paper sale begins November 3 and runs through January 6. The sale allows local artists an opportunity to sell their work while giving patrons an opportunity to support local talent and again, check the names off that gift list! Ink and Paper offer about 500 prints from nearly 100 artists. The event kicks off on opening night with a public reception with many of the artists, and music and refreshments. It’s much more fun to visit The Local Store in person, but just in case your suitcase isn’t big enough to hold all of the awesome things you want to buy, The Local Store has all of their current merchandise available to purchase online. Share your favorite goods from The Local Store with us, and show us how fantastic you look decked out in your finest Eau Claire apparel on Instagram with #CaptureEC. For online shopping, more information on The Local Store and its vendors, or to see the list of upcoming events, visit thelocalstore.org.